Mark your calendars! 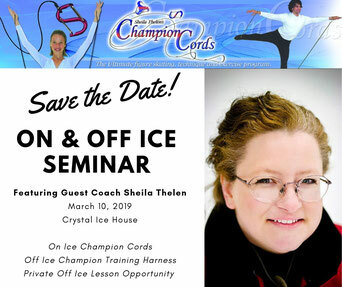 WWFSC is excited to announce the on & off ice seminar that we will be hosting on March 10, 2019 at the Crystal Ice House! Special guest coach Sheila Thelen will be coming into town to lead the seminar. We can't wait! Sessions will be available for low and high skaters. More details available here. Due to low enrollment, we must regrettably make the difficult decision to cancel this year’s competition. While we are certainly disappointed, we know it is the right decision for our competitors and all involved in the planning of this event. Our goal has always been to provide a positive competition experience for the beginning skater and we feel that this is not possible with so few participants across all of the levels. We will be issuing a full refund to the credit card used to pay for the entry fees of all participants. Please allow 7-10 business days for the refund to appear in your credit card account. For those interested in upcoming competitions throughout the area, we encourage you to visit the Skating Council of Illinois' website. Thank you for understanding and please don’t hesitate to reach out to us with any questions. Synchro Illinois is just one week away and the Skating Council of Illinois is seeking volunteers from member clubs (like WWFSC) to help make the competition a success. The competition begins next Friday, Jan. 18 at 3 p.m. with practice ice and ends at 9 p.m. on Saturday, Jan. 19 at the Oak Lawn Ice Arena (9320 S Kenton Ave, Oak Lawn, IL 60453). WWFSC encourages each member to consider volunteering your time on Friday or Saturday or making a food donation. Remember, this competition is a great way to earn your four hour volunteer requirement as a WWFSC member. The time that your family and friends volunteer also counts toward your hours. The profits from this competition are also given back to Council clubs based on the number of volunteer hours, so the more hours WWFSC members contribute, the more money our club can earn.